I enjoyed a quick, easy read that I wanted to share with you. This book was recommended by James Patterson whose work I enjoy. I decided that if he were endorsing this book then it was probably worth the time to read it. It is part of his BookShots series, where he recommends fast reads for under $5 and less than 150 pages. Perfect for when you want a quick read for a lazy afternoon or on an airplane flight. This was the first novel I have read written by Ciotta. It was a fun little romantic love story that held my interest. I read it in one weekend, picking it up whenever I found myself with some spare time. It takes place in Tuscany so right there it was a book after my own heart. It featured a grandmother who loved to cook, another plus. It, of course, has the perfect couple who don't realize that they are perfect and obstacles that get in the way but you know, right from the start, that this is going to be a story with a happy ending. 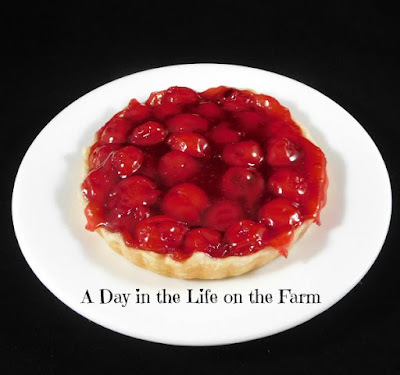 One of my favorite parts was when Megan is getting to know Nick's grandmother who lives in Tuscany and she teaches Megan how to make cherry tarts. I think being in the kitchen with someone is the perfect way to spend time getting to know each other. I made these little tarts for our friend, Chris, who is coming to dinner tomorrow evening. I hope he enjoys them as much as I enjoyed this book. I will be sharing this recipe and book review over at Foodies Read 2017. Come check out what everyone else is reading this month. There is really not much of a recipe for these tarts. I used store bought crust and canned cherry pie filling as I was out of my Homemade Cherry Pie Filling. I added a half teaspoon of almond extract to the canned filling before filling the shells. Measure your tart pans and using a cutter or sharp knife cut out rounds from the unrolled pie crusts to fit the tart pans. Sunday is our Choir Concert, I am making a Cranberry Coffee Cake to be served at the reception following the concert and then we will go out for dinner. Dessert before dinner is allowed every once in a while. Monday evening we have a meeting at church and Wednesday I have Food Pantry after which we will be going over to Amy's to celebrate Melody's Christening Anniversary. I am bringing dessert. We are celebrating #CranberryWeek in our Festive Foodies Event Planning group, so stay tuned for lots of wonderful recipes containing these little powerhouse berries. So here is my Weekly Menu. Please stop by each day as I share recipes and photos. I love cherries any form. Simple recipes like this hit the spot. 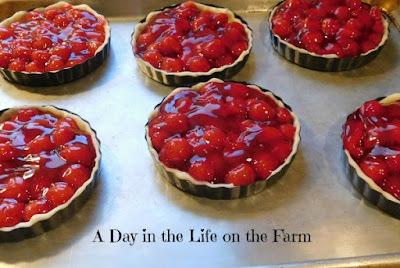 Those little tarts look wonderful, and the book sounds like a cozy comforting read as well. It was a quick easy read Claudia. Perfect for a free evening or weekend.